What are the Benefits of Writing Long Blog Posts? Many bloggers and website owners write short contents. Then they are waiting for getting traffic. But the problem is short contents don’t perform well on Google rankings. If you write less than 300 words mean you are wasting your time and resources. Writing long blog posts has many benefits. Blog posts with more than 2000+ words always come to the top of the google rankings. Nowadays you need lengthy content to target a specific keyword because the competition is too high. Most of the bloggers now target long tail keywords. Every blogger should believe the phrase “Content is King. Which describe the power of the content. Short blog posts don’t have much value or future. If your target is to get profit for a long time then you need to write long blog posts. Neil Patel is a world famous internet marketer. Once he said he was making 100K visitors per month from his blog neilpatel.com. All of his blog posts were 4000+ words and he believed content with more than 3000+ words which always comes to the top 10 results. Neil says long blog posts get more social shares, backlinks, and organic traffic. Long blog posts have many SEO benefits. That’s why they perform well on google search results. If your site has long blog posts you don’t need to think about much on SEO. People will spend a long time on your site for reading your contents. If people your content for a long time then google thinks this content is useful for him. This will help to reduce the bounce rate of that particular site. Bounce rate is one of Google’s on-site SEO factor and it’s better if you can reduce it under 35%. When your site comes to the top results in google, you will receive more organic traffic. It will help you to increase your Google Adsense income and affiliate income. The major target of any blogger is getting traffic from search engines and increase their blog income. Neil Patel says articles with 2000+ words get more twitter shares and Facebook likes. We need to believe his saying and actually great articles get more engagements on social media sites. If you can produce an interesting article with great content then you will understand how it performs well on social media sites. Interlinking is a great way to connect with old blog posts. You can connect many of your old blog posts within a single blog post when you are delivering such a long article. Then your old blog post gets traffic after your current blog posts get traffic. With this method, your views also increase and you can stay your new visitors for a long time with your site. 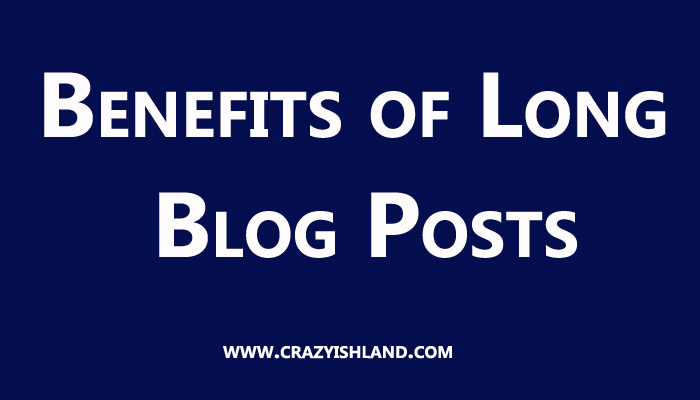 So these are the major benefits of long blog posts. Now you will understand why professional bloggers try to write articles with more than 2000+ words. To compete with them you need to produce such articles. Before writing any blog post collects a lot of information regarding your topic. Then you can continue your article until the total counts get more than 3000+ words.